Another month has passed, and we're that much closer to getting our Alpha 1 backers into VoxElyria. Let's take a look back at the exciting month of March, meet a mod, an organization, and bask in the wonderful fan media our community produces. Starting in March, we launched Surname reservations. Since then, thousands of Chronicles of Elyria players have reserved their name of choice and started along the path of building a dynasty. Surname reservations continue and last through Exposition. Who knows what interesting submissions we'll see as more and more players pick the names of their families. Our layaway program ends on April 30, 2018 at midnight Pacific Time. Make sure you are able to take advantage of your locked-in prices before they go away for good! Pledge package prices will increase later this year so your layaway is the last chance to take advantage of this price! In addition, Surname Reservation and other upcoming features require you to have a paid-off package. Any left over layaways remaining after April 30 will be converted into store credit. A Communication DJ from Vye, Crafting DJ from Snipehunter, and Map generation DJ by Caspian, a triple play! When will they drop, which will come first? Stay tuned to our social channels and website next week and perhaps you'll learn more!! The Renewal Festival has ended and we hope you all enjoyed the new lore released; the Cardinal Miracle of the Second Age as well as the limited time store items such as the adorable Foxcelot and the Cardinal Beekeeper Kit. As far as the most popular items? The Foxcelot outsold everything else, but the Cardinal Beekeeper's Kit was a close 2nd! The Tribemoji contest has been going strong now for almost 2 weeks, and we've had quite a few submissions so far! We're really excited to let the community vote on all of the really interesting entries and find us permanent ones to upload to the official CoE Discord. So far, we've had a total of 29 entries for all of the 8 allowed launch tribes. For more details about this awesome contest, and what you could win, read the announcement thread here! Keep those entries coming, there's still over a week left to submit your masterpiece(s)! Here's a close-up of one of my favorite tribes, the Mydarri. (Please be aware that this image is still a WIP and does not include final treatment). They have both been around the community for a while, and as a result have a lot of knowledge about CoE. Plus, they are darn fine people and fun to interact with. As previously announced, give a warm welcome to Esoba and Captain Seli for joining the official Chronicles of Elyria moderator team! Additionally, earlier in the month we elevated the ever-considerate Polite to Super Moderator! 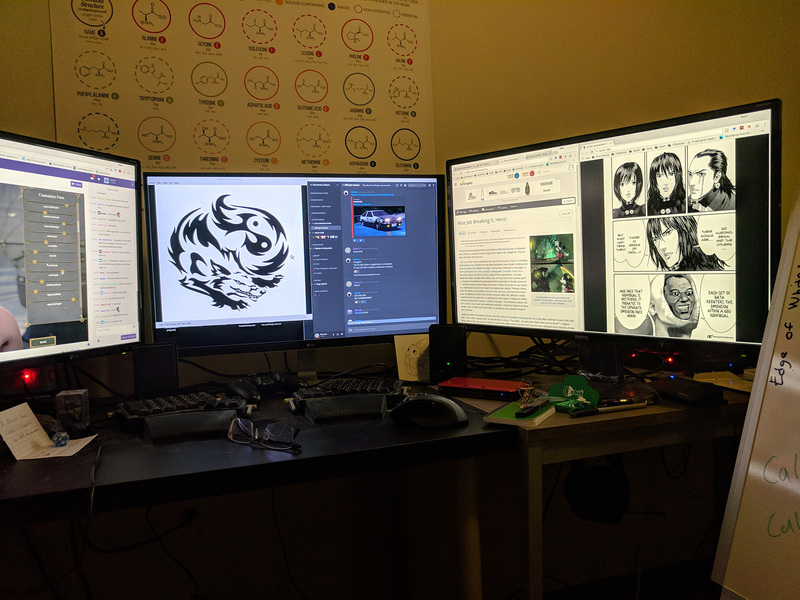 This month, we meet Kyxsune (or Zenko on Discord), a mod for almost a year, and a community member for even longer. Let's ask him some questions! Q1: You’ve been in the CoE community for quite some time, tell us how you came across this game we all love? A1: "I remember the first came across CoE during the Kickstarter, and like many I was skeptical. I took a pass at that time, but I made a mental note to follow their progress. Four design journals later, and I became a believer." Q2: Have you been a gamer all your life? A2: "As long as I can remember, though I still haven’t beaten the very first game I purchased myself: Pikmin. That level of time management, planning , and risk assessment was not suitable for a kid….or an early teen...or adult me." Q3: Pick one: iOS or Android and why? A3: "Android, I think there is a region in my brain dedicated to google that screams “google it” whenever there's a question and converts all my thoughts into search terms." Q4: Pop rocks or Twizzlers? A4: "Neither, seriously that's the Halloween candy you trade away for skittles. Two tiers above candy corn." Q5: What do you like about being a CoE moderator? A5: "I like getting to interact with so many people through discord and the forums, and having to seriously consider dissenting opinions, their motivation, and logic, instead of just dismissing them. It's been an eye opening experience." A6: "I really dislike when a debate or discussion turns into a mud slinging match. Oh, and discussions about cannibalism." A7: "Definitely sporting events, mostly esports though. I tend to avoid plays, as they have a formal air around them, but oddly enjoy the laid back movie. Esports (mostly LoL) are exciting to watch, due to nostalgia from when I played a lot of them." Q8: You have 2 different handles, one for the forums and one for Discord, is there any reason for that? 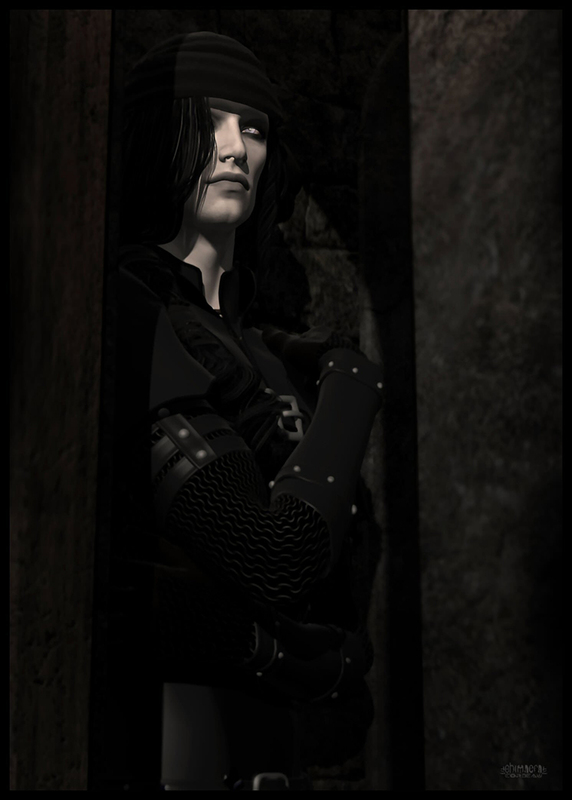 A8: "Zenko is my surname for CoE, while Kyxsune is more like a general tag. There’s an obvious theme between them, and all the tags I use. As to why they are they separate, it's mostly a separation of character." Q9: What upcoming event in CoE are you most excited about? A9: "Map selection. Its a large step towards playing CoE and a large part of realizing players ambitions. Even the geography of Elyria is influenced by the players of Elyria, and that is something special. Also me: I am excited for the conflicting priorities in landscape directing player’s votes." Q10: What would you like to say to the entire CoE community right now? 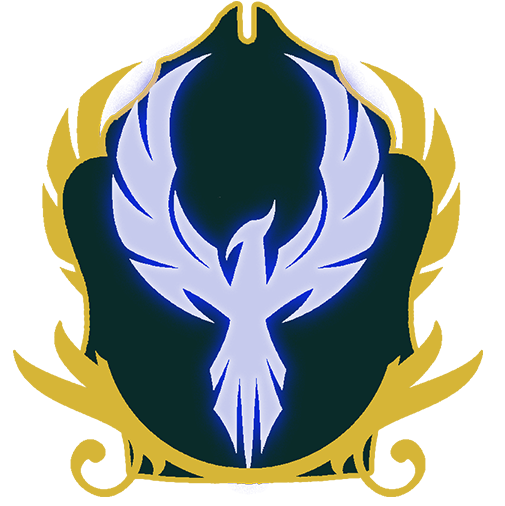 Crest: "The Kingdom crest is that of a rising White Phoenix, chosen due to the bold imagery that can be created and with ties to established ‘canon’ lore written within the Kingdom. It represents the Kingdom rising from the fires of a civil war, the Nobility pulled together under a new young Monarch to rebuild from the ashes. The Phoenix also symbolizes the eternal life of the Monarchy, and the perpetual spirit of the Oakheart lineage passing down through the line of succession." Goals of the Kingdom: "We are a Kingdom that has always stated that we wish for three things in essence: Peace, Prosperity, and Protection. Naturally the three all tie together - by maintaining friendly relations with other Kingdoms we allow prosperity to flow. The bounties of this prosperity then flow back into ensuring that the Kingdom can protect itself should relations sour and the drums of war begin to beat." Fun fact: "Ironically, given the name of our Monarch, we have a propensity to share pictures of cats." If you'd like a chance to get your community content featured, submit your original creations here. We get so many submissions, it is hard to show you all of them, but here's a sampling. If your submission wasn't featured this month, we may still use it in the future! 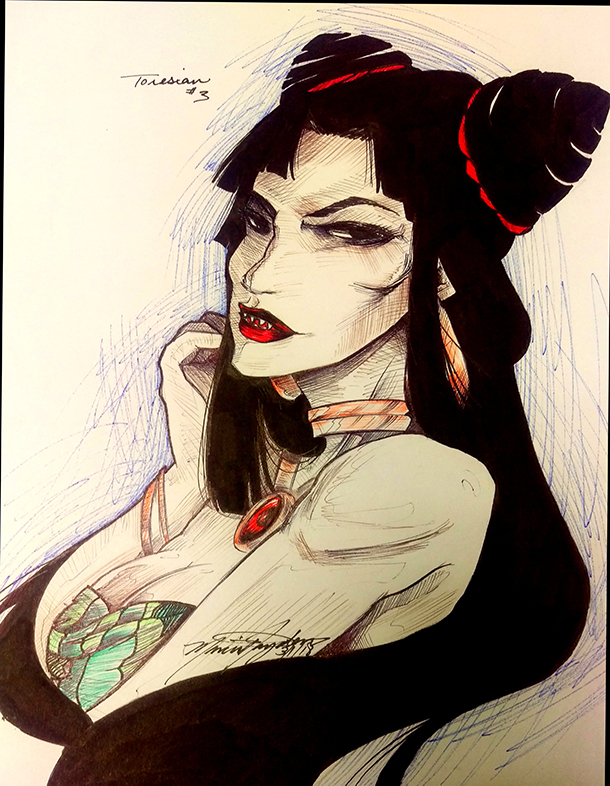 Lady Tzayelle shared this fan art of a To'resk female, made most in ball point pen! She says "I was just doodling and trying to figure out how To'resk women might look, and out popped this sketch--sketch #3!" 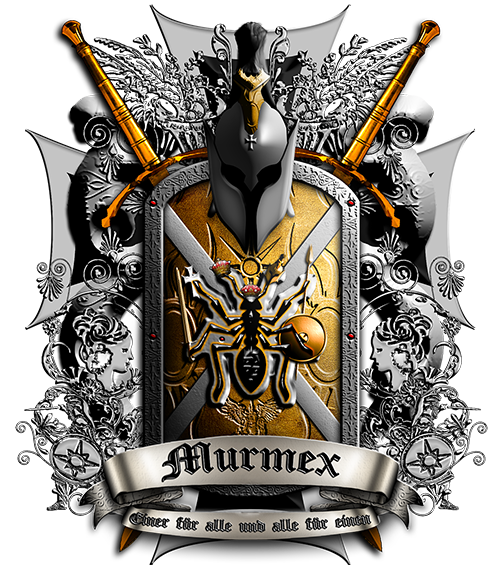 Sent to us by Namykos, this custom Coat of Arms of their County named Murmex, "strongly takes inspiration of the Myrmidons (Homer's Iliad), the Teutonic Order and Prussia". Chimaera Corbeau (or Eyes of Cimeies on Discord) sent us their "Awaiting Dusk" fan art, dark but dreamy! To find other art by them, look for them on Facebook under My World Digital. Our friendly artist, storyteller and community Ambassador Bombastus has shared with us a three page graphic tale about death, rebirth, and soulmates. See it here. Starting next month, we'll be sharing more information about a new community volunteer role, the Subject Matter Expert. Now that our design team are rapidly growing and expanding our skill systems, the more knowledge and research they will need on various subjects. With many experts right under our noses in our community, this program aims to allow you to share your expertise with the studio, ensuring our game is as realistic and immersive as possible. Stay tuned! Coming soon we'll have Map generation and voting, the Grand Faire of Elyria, Personas, and so much more! I would like to volunteer as an SME for Magic and Talents, with a focus on the narrative impacts for the goals of realism, immersion and keeping magic special. I have read various works of fiction and nonfiction, philosophies and theories so I believe that I could create a very valuable discussion for development. Why was cumhail declined. Isn’t it Irish? Quick question please let me know if t has been answered already but If I still have a current layway that is not paid off yet after April 30th the money that I have paid for it will be turned into store credit? Or will I still be able to make payments on the layway and finish paying for it? "Any left over layaways remaining after April 30 will be converted into store credit." Quick question please let me know if t has been answered already but If I still have a current layway that is not paid off yet after April 30th the money that I have paid for it will be turned into store credit? Or will I still be able to make payments on the layway and finish paying for it? "Any left over layaways remaining after April 30 will be converted into store credit." Super inactive user, got the e-mail just the other day (or noticed anyways.) Why is layaway being removed? I understand that a game in development still has it's budget, but my $60 out of $200 was already committed without much evidence that this game had any merit >yet<. Obviously now with character creation and maps and lots of tech demos it's become thoroughly fleshed out, but what if I can't scrap up the remaining $140 in the next couple weeks? Rent and school are sort of a priority before game life. If I had locked into a cheaper tier originally then I'd have no problem paying off my remainder, but unfortunately $140 is a pretty sizeable chunk of money to have to pay off before April 30th. Do I have to bite the bullet on my Ursaphant just to be able to live by my budget? Why was there not any sort of warning that would've actually given me 2 months to pay it off, like the email suggested? There was a warning - it was said that layaways would need to be paid off by May 2018 in this announcement, which was in October of last year and the time when layaway was brought back. If you can't pay it off by then, you'll still have access to the highest pledge tier you paid for, and any excess you paid will be converted into store credit, I believe. Edit: also, I checked - there were three separate emails warning about the end of layaway in May. One on January 27th, one on February 28th, and one on March 29th. I'm really confused how you could have missed all of the signs. Posted By **AdinX** at 07:22 AM - Tue Apr 03 2018 > > Super inactive user, got the e-mail just the other day (or noticed anyways.) Why is layaway being removed? I understand that a game in development still has it's budget, but my $60 out of $200 was already committed without much evidence that this game had any merit >yet<. 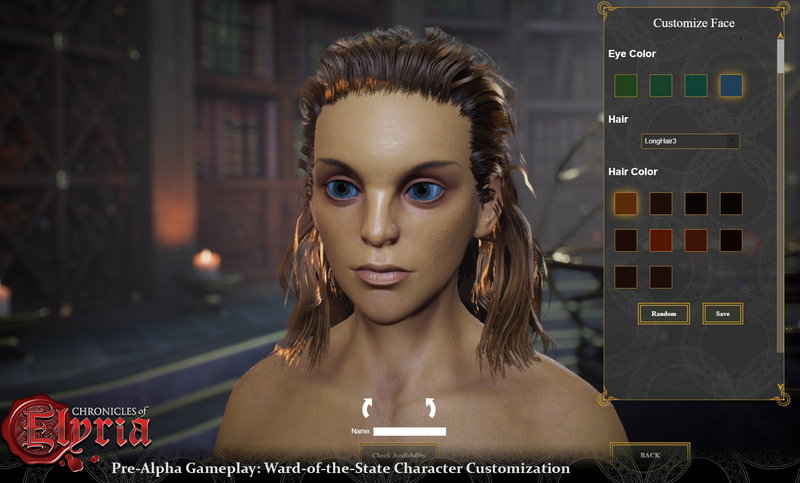 Obviously now with character creation and maps and lots of tech demos it's become thoroughly fleshed out, but what if I can't scrap up the remaining $140 in the next couple weeks? Rent and school are sort of a priority before game life. If I had locked into a cheaper tier originally then I'd have no problem paying off my remainder, but unfortunately $140 is a pretty sizeable chunk of money to have to pay off before April 30th. Do I have to bite the bullet on my Ursaphant just to be able to live by my budget? Why was there not any sort of warning that would've actually given me 2 months to pay it off, like the email suggested? There was a warning - it was said that layaways would need to be paid off by May 2018 [in this announcement](https://chroniclesofelyria.com/forum/topic/22081/upcoming-changes-in-the-store-offerings), which was in October of last year and the time when layaway was brought back. If you can't pay it off by then, you'll still have access to the highest pledge tier you paid for, and any excess you paid will be converted into store credit, I believe. Edit: also, I checked - there were three separate emails warning about the end of layaway in May. One on January 27th, one on February 28th, and one on March 29th. I'm really confused how you could have missed all of the signs. This was said months ago. Also, I believe that no new layaway can be done, but old ones can still be paid off. This would mean you are fine, but I would of course suggest you send a message to the dev team directly as they are more likely to see it and address this issue. 1. This was said months ago. 2. Also, I believe that no new layaway can be done, but old ones can still be paid off. This would mean you are fine, but I would of course suggest you send a message to the dev team directly as they are more likely to see it and address this issue. Really love the amount of thought Katlynna has put into the Kingdom, it's awesome to see Oceanus being engaged. All sounds amazing. Really looking forward to crafting and seeing more about the Subject Matter Experts! The game is still about a year from release and already I see SBS doing exactly the things that so many game companies should be doing. Now they're going to directly query the playerbase to help make the game material more authentic? Don't fool yourself, a game this ambitious with over 400+ features will be released to the public at the earliest in 19Q4, more likely 20Q1. Yay my mate Namy on the journal. Gz mate. I hope April will be as good. Always love seeing the talent in this community! Great news!! Hope to see those DJ soon! I love your art work. Just doodling? Now I'm Impressed and Depressed at at once. Keep up the good work. Posted By **Lady_Tzayelle** at 7:55 PM - Fri Mar 30 2018 > > Posted By **VioletWinterlynn** at 5:46 PM - Fri Mar 30 2018 > > > > > Thats my countess' beautiful artwork! I love it ^.^ Shes gorgeous > > Luv you, Queenie! <3 I love your art work. Just doodling? Now I'm Impressed and Depressed at at once. Keep up the good work. Awesome on the expert bit. Putting my name as well as Luminios for European armor and combat. If I don't know a specific material in those categories, I know someone who does. Awesome on the expert bit. Putting my name as well as Luminios for European armor and combat. Going to shamelessly plug some of the topics I've posted: - **[Historical Diagrams of European Weapons and Armor](https://chroniclesofelyria.com/forum/topic/1296/historical-diagrams-of-european-weapons-and-armor)** - **[Historical European Combat Resource](https://chroniclesofelyria.com/forum/topic/2630/historical-european-combat-resource)** As well as linking to the library of topics Luminios made: - **[Arms and Armour-A Collection of Threads](https://chroniclesofelyria.com/forum/topic/21442/arms-and-armoura-collection-of-threads)** If I don't know a specific material in those categories, I know someone who does. I reserved "Redbeard" for my future Hrothi....about ten seconds later Caspian made the comments about how its shameful for Hrothi to have beards. I look forward to the volunteer program! Things are really ramping up! Thanks for the update! True, but that is why we'll be specifying what areas of expertise we're interested in. You just never know...The new coach of the Detroit Lions IS actually an aerospace engineer...Not sure how it will effect their passing game, but still an interesting nugget nonetheless. Well now, I'm even more excited for next week after reading this. This subject matter expert is very intriguing. Well now, I'm even more excited for next week after reading this. This *subject matter expert* is very intriguing. Sign me up as an expert Serp! Excellent Communuty Journal :) I love the Mydarri, their eyes are so awesome! In regards to Zenko, I totally agree that the cannibalism is so over done in the discord heh! I look forward to the next one. Yes, Cannibalism should NEVER be overdone. Medium rare. WickeD Evil Grin. Posted By **SirApetus** at 6:01 PM - Fri Mar 30 2018 > > Excellent Communuty Journal :) I love the Mydarri, their eyes are so awesome! In regards to Zenko, I totally agree that the cannibalism is so over done in the discord heh! I look forward to the next one. Yes, Cannibalism should NEVER be overdone. Medium rare. WickeD Evil Grin. Wow that's amazing artwork, and backlore... I'm so excited to be a part of a game that's so passionate.